Lonny Price's film adaptation of the acclaimed stage play originally slated for Blu-ray in July is now coming in October. 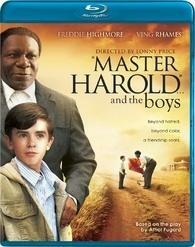 As previously reported, Image Entertainment planned 'Master Harold ... and the Boys' for Blu-ray on July 5, but now it looks like it's coming October 11. Freddie Highmore ('Charlie and the Chocolate Factory') and Golden Globe winner Ving Rhames ('Pulp Fiction') are unforgettable in Athol Fugard's searing coming of age masterpiece set in apartheid-era South Africa. Lonny Price, who portrayed Hally on Broadway, captures all the heartbreak and humanity of one of the most celebrated plays of our time. Specs have yet to be revealed and there doesn't appear to be any supplements on the Blu-ray. You can find the latest specs for 'Master Harold ... and the Boys' linked from our Blu-ray Release Schedule, where it is now indexed under October 11.